The transformation is taking place, whether we notice it or not. We change as individuals and as part of the bigger picture. A lot seems possible. We might need time though to get used to our increasing intuition and abilities. We notice we are becoming more sensitive and are learning to trust our gut feeling. This can lead to confrontations with our environment. The body is willing to receive information and, when you intend to change as well, it accelerates the process of transformation. The body knows how to adapt to the new input The blueprint in each cell changes and begins to crystallize. It makes each cell a receiver and a transmitter of information, just like a crystal in an old-fashioned radio. Of course, the body already was a perfect receiver and transmitter but is now becoming stronger at a rapid pace. It creates new and sometimes unknown physical sensations. Best to let it happen. Don’t hurry, give it time. Let the cosmic winds pull open the windows! 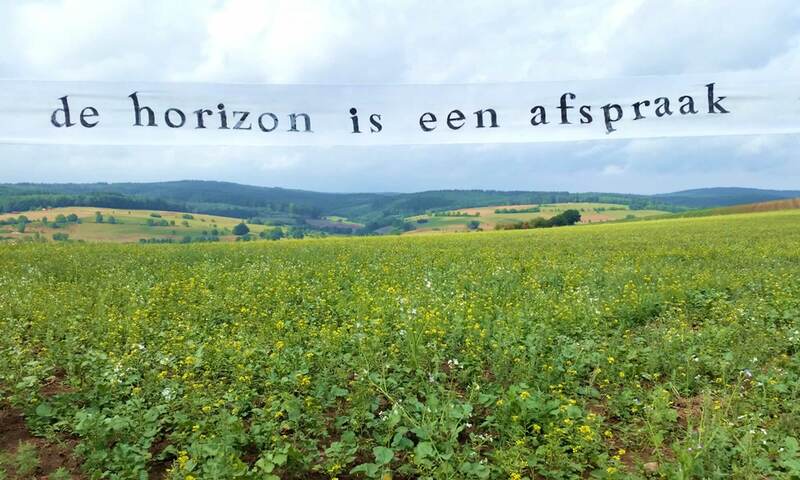 Allow yourself to view a brand-new horizon. There will be sunshine and showers, just stay aware and know that you are being guided. As a Transformational Coach, I like to assist you in the process. In a Personal Journey, you focus on the essence of your physical and your spiritual health, your relationships, family, work and finances. You also look at your past lives, karma and your Soul Intent. I work with Healing, Cord Cutting, Soul Retrieval, Spirit Release and Regression as well as with Reading and Constellations. By working intuitively the essence of what’s going on in your life at that moment becomes clear fast. You gain clarity about the origin of your blockades, desires and intentions. In the course of the Journey, you can also become aware of your relationships with deceased persons or with your Soul group. Personal Guides might make themselves noticeable. By becoming aware of your choices and chances in life subconscious restrictive programming can be cleared and rewritten. You’re now free and back on track! In my experience, nothing can be enforced in the Cosmos but it did show that when you surrender to the process of healing and awareness, the Cosmos likely will lend you a hand and surprise you in unexpected ways! A Personal Journey consists of 5 to 8 sessions. A session takes 1 to 1,5 hours. There are 3 weeks between successive sessions. The sessions take place in Amsterdam. When appropriate a session is done at your work area or outdoors. An intake session is required. The exchange is € 400 to € 1000, depending on the number of sessions. It includes material, recordings and VAT. I work to a strict Code of Conduct so all sessions are confidential. Still a bit confused by all the changes? Plan to do an MOT session, a ‘More Open to Transformation’. A MOT session means I tune in to your relationships, your work, your health and how you express yourself in this world in a two-hour session. The fee of a MOT is 180 euros, vat included. You receive a full-colour scan of your chakras and an indication of the blockages of the energy flow in your body and your aura. A couch healing might be part of the MOT session. Of course, there is coffee, tea, and organic cookies. The MOT sessions are given in Praktijk voor vrijer leven’ in Hillegom, a location close to Schiphol Airport. Speedbus 361 takes you there in 20 minutes. Remember, even if everything changes, it remains possible to feel at home on this earth. A Healing can be part of a session. When you feel tired, stressed or out of balance, unwell, injured or in pain, healing can assist you in grounding and reconnect with your ability to find balance and harmony. Healing is holistic, it treats the whole person, mind, body, and soul. Giving healing means to channel energy. It is inviting the body to open up and accept the healing intention of the body. Healing is an ongoing journey of discovery in search of more answers and ultimately being healthier and striving for wholeness. It’s for those who seek to explore and experience health beyond the physical. Everyone is affected by the complexity of everyday life, increasing bureaucracy and the uncertainty concerning income and security. Taking care of your inner balance and good health is a basic condition to enjoy life. Workshop Grounding 16 March 2019 Hillegom. English spoken. More info Flyer Workshop Grounding. Cursus ‘Werken met je gidsen’ 27 febr – 29 mei 2019 Hillegom. Klik hier voor Flyer. 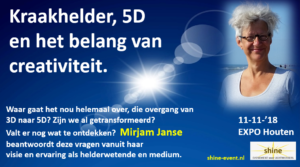 Marjolein Bindels van Meerradio interviewt Mirjam Janse over spiritualiteit en bewustwording. Het radio interview, opgenomen op 4 november 2018, nu als video. Klik hier. ’Kraakhelder’ gaat over ’De vijfde dimensie en het belang van creativiteit’. De lezing begint om 10.30 uur. Deze lezing is onderdeel van ‘Shine’, een dag vol lezingen, georganiseerd door Earth & Beyond. ‘Shine’ wordt gehouden op zondag 11 november in de Expohallen in Houten van 10.30 uur tot 18.00 uur. Meidoornkade 24, 3992 AE Houten.